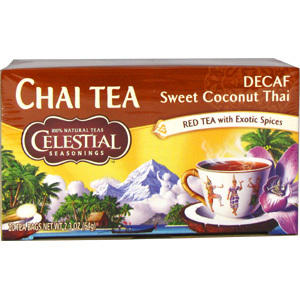 Naturally decaffeinated black tea, caffeine free rooibos and aromatic Thai spices mellowed with creamy coconut. "Travel through India's fertile valleys and wild mountain ranges and you'll find some very inventive chai recipes — but none like this! 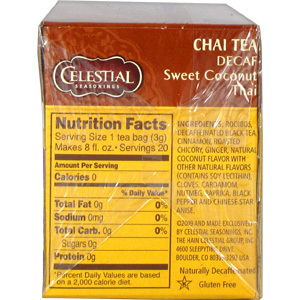 Decaf Sweet Coconut Thai combines caffeine-free Rooibos and decaf black tea with creamy coconut and aromatic spices like ginger, cardamom and star anise. 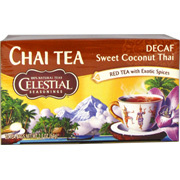 Add warm milk and sugar or honey for a sweet and spicy chai experience." This is my favorite chai tea, It is high in caffeine and the spices give the illion of sweetness so you dont have to add much extra sugar or not any at all. The teabag is strong enough for 2 to 3 cups. I haven't been able to find this tea in any store only online. I'm glad I found it. The tea is the best and the taste is super authentic chai from an indian restaurant when you add milk. Will buy again. 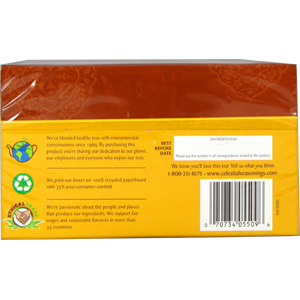 Decaf Sweet Coconut Thai is shipped in a discrete, unmarked package. Orders are processed immediately and usually takes about 3 to 5 working days to be received. We do ask that you try it for 2 to 3 weeks to feel the full effects. Any information received is used only for order processing and shipping purposes. Your information, such as e-mail address, will never be disclosed to a third party.